There’s no ducking back into the kitchen to grab a spatula or a can of brew once you’ve hit the battlefield—a.k.a. your outdoor kitchen—after donning this camouflage beaut. 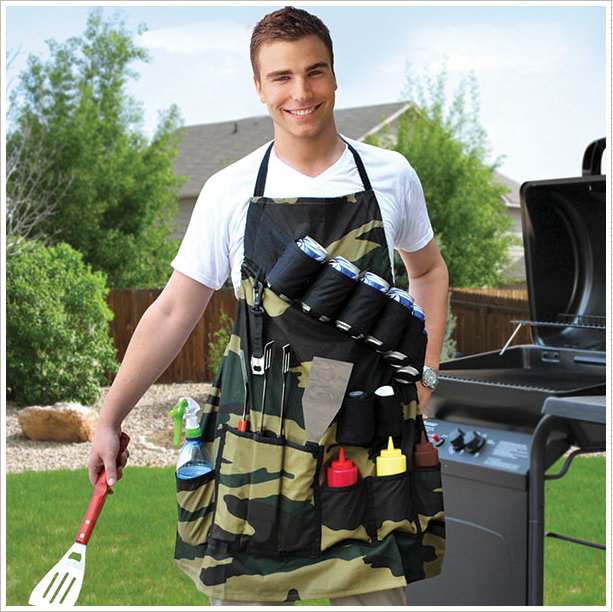 Keep everything you need to grill on your person, and use the military-style print to hide in the bushes in case you need to hide from annoying neighbors. Make sure even more grilling accessories are at the ready by building a grilling station. Weigh your backyard food-prep options with our guide to installing an outdoor kitchen. Previous Post Vanity Fair Features Hostess Gifts That Guarantee You’ll Be Invited Back – With the Cheeseburger Float from BigMouth Inc.